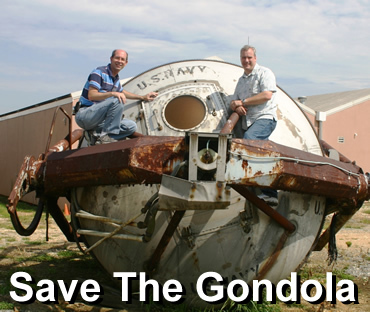 Help us restore the original gondola | The Johnsville Centrifuge and Science Museum, Inc. The original centrifuge gondola that was used for training the Mercury astronauts was located at the Paul E. Garber artifact storage facility of the National Air and Space Museum where it was safely sitting in their outside storage yard, away from public view, for over 45 years. This important artifact was part of the Smithsonian’s collection and was “deaccessioned” or taken off their books. It was returned to Warminster to great fanfare on May 5, 2011. Efforts are now under way to preserve this important piece of space history. It is currently on public display adjacent to the Penn State Anechoic Chamber at 300 East Bristol Road in Warminster. We have recently recieved a grant from the County to start the planning process. Corporate sponsorships are available, or you can make a personal donation by clicking on the “Donate” button on the left hand border of our website. You can get regular updates on the status of the gondola’s restpration by joining us on Facebook or by signing up for our newsletter.